Bring 4 cups of water to boil. Rinse and chop beet greens. In heavy saucepan cook onion in butter over moderate heat until softened. Add beets and cook, stirring occasionally for about 5 minutes. Stir in 1 cup of Arborio rice and cook for 1 minute. Add 1 cup of shimmering water, stirring constantly, until absorbed. Continue cooking and add 1/2 of water at a time. Making sure each addition is absorbed before continuing. Remove pan from heat and add 1/2 cup of Parmesan cheese. Serve immediately. Rinse and chop one bunch of collard greens and half a head of red cabbage. In hot skillet, add 1 tbsp olive oil, balsamic vinegar and chopped garlic. Add greens ad saute for 10-15 minutes. Serve chilled. Bring 8 cups water to boil in medium saucepan. Add rice noodles; cook 3 to 4 minutes or until tender. Rinse and chip bok choy. Add to boiling water and cook for 8-10 minutes. Drain and rinse with cold water. Bring 4 cups of chicken stock and 4 cups of water to boil. Add Bok choy, rice noodles and shredded chicken (store bought rotisserie chicken makes this easy!) and bring down to a simmer. Serve in large soup bowls. Optional: add hot sauce. Rinse and de-shell one can of chickpeas. In a small bowl, mix chickpeas with olive oil, salt, paprika, and chili pepper and set aside. Rinse and chop kale. Mix 2 tbsp of olive oil and 1/2 of a lemon and massage into kale for a few minutes. Let kale mixture sit for an hour. Mix chickpeas and kale into cooked couscous. Dress with lemon and salt and pepper. Serve chilled. Preheat oven to 400°. Slice baguette into 3-4 inch pieces, drizzle with olive oil and rub with a garlic clove. Bake for 3-4 minutes. In a small bowl, mix together cherry tomato halves, fresh mozzarella, 1 tbsp. olive oil and chopped scallions. Remove bread from oven and top with tomato mixture. Preheat oven to 400°. Line a cookie sheet with parchment paper. Rinse carrots, remove the stems and pat carrots dry. In small bowl, whisk together 2 tbsp. olive oil and 2 tbsp. balsamic vinegar. Pour mixture over carrots and toss until coated. 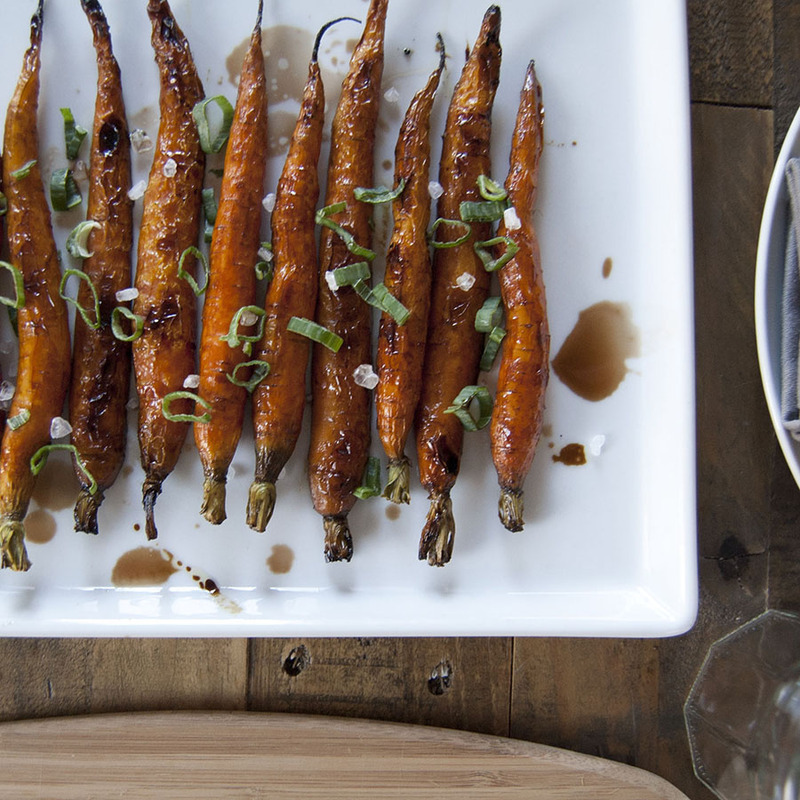 Place carrots on parchment paper and bake for 30-40 minutes (this depends on how crispy you like them). Remove from oven, sprinkle with salt and serve warm. Preheat oven to 425°. (For best results, keep pizza stone in the oven while preheating. This will heat the stone and give the pizza a nice crispy crust.) Rinse and chop leeks. Remove pizza stone from the oven, top with pizza crust, and drizzle with olive oil. Season with salt and pepper. Layer grated fontina cheese, leeks, and top with crumbled goat cheese. Bake for 10-12 minutes. Slice and serve hot. 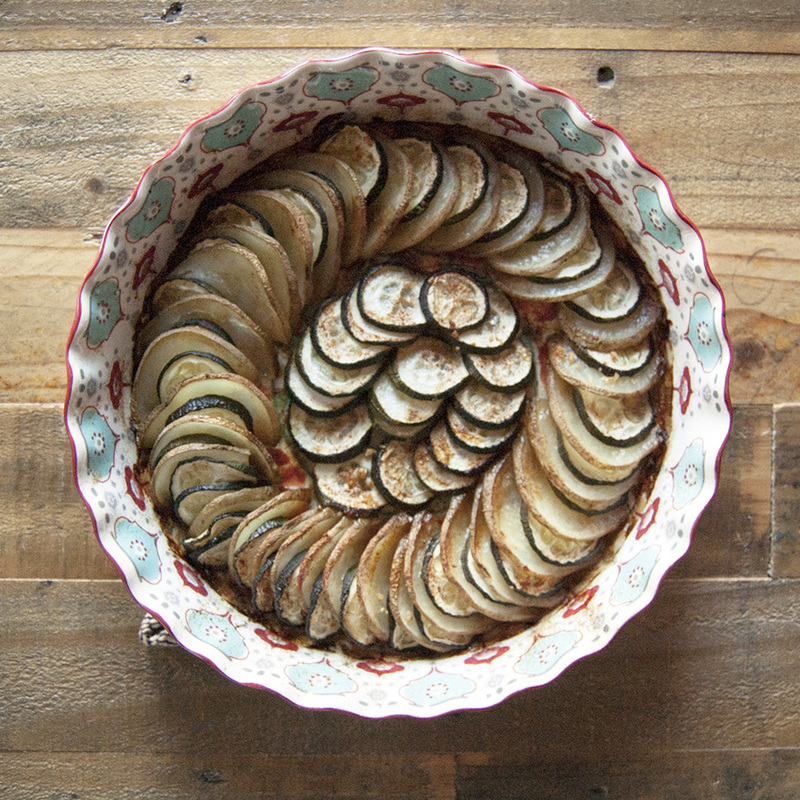 Rinse zucchini and potatoes and thinly slice (using a mandoline works best for uniform pieces). Starting in the middle, alternate zucchini and potatoes, rotating around the dish. In small sauce pan, melt butter and garlic. Pour over vegetables and bake for 15-20 minutes. Serve warm. Rinse cabbage and chop into thin strips. Cut apple into quarters and remove core and seeds. Use a mandoline to thinly slice the apple. In skillet, heat 2 tbsp. olive oil, add cabbage and apple slices. Sautée for about 10 minutes. Serve warm.